This exciting program is facilitated by our partners at Pathfinder Outdoor Education. Pathfinder is a non-profit organization founded in 1993 and is dedicated to building personal, social and environmental responsibility through the power of shared experience. 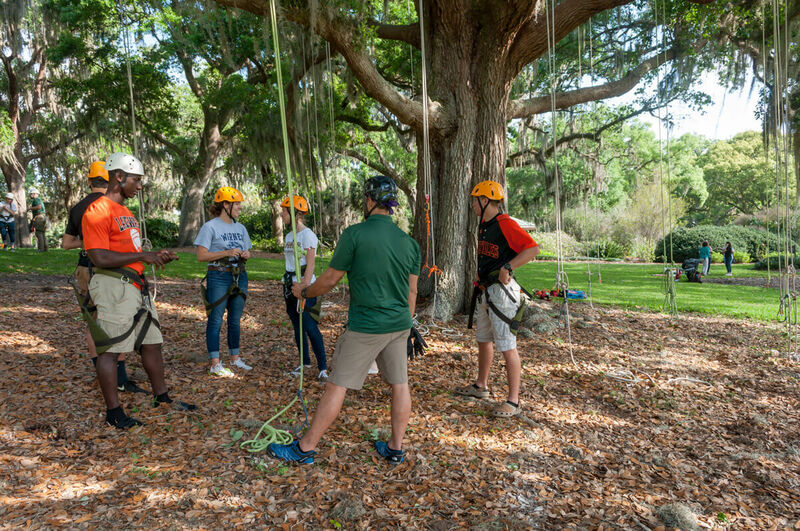 Get a bird’s eye view as you dangle from the branches of a tree safely tethered by a rope and harness. The self-belay technique taught by our staff, let’s you choose the height of your ascent. This is a great peak experience which promotes self-reliance, healthy decision-making and adventure! Include a picnic lunch and a walk to the Tower to give each student a chance to reflect on their own character and imagine how they will make the world a bit better and more beautiful. Or order a catered lunch and reserve our classroom to continue your own team meeting. This was so amazing. I loved every second of it. Wonderful day, very well planned and executed. Gave all students an equal opportunity to achieve and be a better leader. Meets the needs of students First through College. Building Character programs are implemented in partnership with Pathfinder Outdoor Education. Pathfinder is a non-profit organization founded in 1993 and dedicated to building personal, social and environmental responsibility through the power of shared experience.